In the middle of the island, a small tarped area is home to Gili Trawangan’s only glass brick factory. This small one man operation has been running for 2 and a half years funded only by the non government environmental organisation – the Gili Eco Trust. Glass aggregate arrives by the sack full from the Eco Trust’s glass crushing facilities with each sack holding up to 4 baskets of crushed glass bottles. Each bag weighing in at around 25kg can make up between 10-15 glass bricks that can be used for building materials! Reusing and recycling the glass bottles that are otherwise thrown away as waste is desperately needed on Gili T. On an island full of parties, alcohol and drinking, the amount of glass left over each night is always on the rise as no rubbish ever leaves. The Gili Eco Trust are currently raising funds for two engines for a rubbish barge to take Gili T’s rubbish Lombok’s Bank Sampah (rubbish bank) where it will be sorted further and sent to recycling facilities around Indonesia. The process time is around 35 bricks per hour and with a very similar production technique to other island made bricks just from sand; production has the opportunity to be expanded. If you spent a lot of time as a kid on the beach creating sand castles then the process wouldn’t be so unfamiliar to you. After mixing the bags of glass sand with a small amount of cement and water, a thick paste is then put into brick moulds, compressed and left to dry. After 24 hours, these rows of broken glass bricks have dried enough to be used to build with. 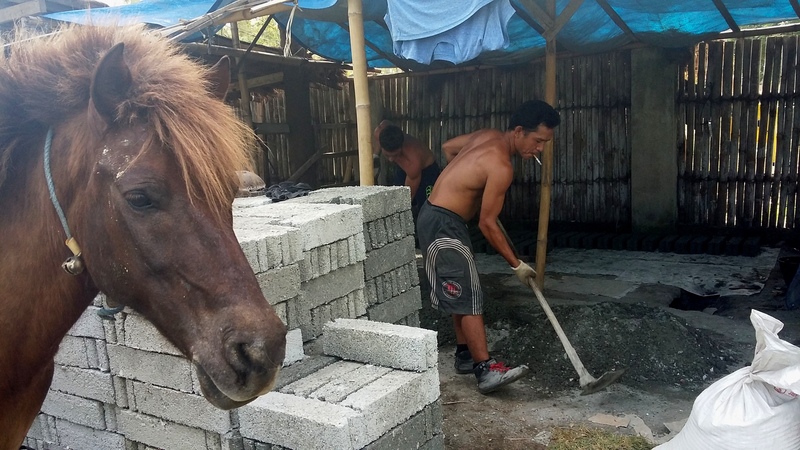 Even though the production line is small it is very efficient and proving to be competitive to the price of regular sand bricks (3,500rp per brick including delivery, no minimum order) hopefully soon businesses will pick up on buying these glass EcoBricks for a greener future on Gili. On closer inspection of the rows and rows of drying bricks, labels from their previous lives pop through, Smirnoff and San Miguel and worst offender, Red Bull, are among many of our upcycled boozy bricks! Little shards of coloured glass shine through as they dry in the sun showing forever a reminder that new development and businesses on Gili now have the option to be built out of environmentally friendly building materials whilst helping to mitigate the islands ever growing rubbish problem. So far already the bricks have been used and built by , Kalm Villas, Tir Na Nog Irish Bar, Sama Lama Villas, Eden Cottages, Manggo dive, Villa Ottalia, Anna Walker and Ketut Power and the new rubbish facilities. We are fast taking orders for more batako for more development that wants to have a greener status on their businesses. These bricks are heavier and stronger, made of glass sand, cement and fresh water, they are perfect for good insulation walls, as well as foundations. Even over time, they won’t be subject to termite attacks due to the fresh water instead of salt or saline water. The project manager of the Gili Eco Trust, Delphine Robbe has built her house entirely of recycled wood, eco bricks and glass mosaic windows creating some beautiful architecture with a low environemtnal impact.